J Auer, R Berent, E Lassnig, T Weber, B Eber. Late Onset of Symptoms of Ebstein's Malformation. The Internet Journal of Cardiology. 2001 Volume 1 Number 2. A 50 year old man was admitted to hospital because of dyspnea, atypical chest pain and fatique lasting for 3 months. Echocardiography showed right ventricular dysfunction and severe tricuspid regurgitation. The tricuspid valve leaflets did not attach normally to the valve annulus, and the effective orifice was displaced downward into the right ventricular cavity at the junction of the inlet and trabecular components of the right ventricle consistent with the diagnosis of Ebstein's malformation. Clinical presentation of Ebstein's anomaly with symptoms occurring first in adulthood despite moderate to severe tricuspid-leaflet displacement with valvular dysfunction and elevated right atrial pressure is rare. Ebstein's anomaly is an abnormality of the tricuspid valve in which the septal leaflets and often the posterior leaflets are displaced into the right ventricle and the anterior leaflet is usually malformed, excessively large, and abnormally attached or adherent to the right ventricular free wall 1 , 2 . Thus, a portion of the right ventricle is “atrialized” in that it is located on the atrial side of the tricuspid valve, and the remaining functional right ventricle is small. The tricuspid valve is usually regurgitant but may be stenotic. Eighty percent of patients with Ebstein's anomaly have an interatrial communication (atrial septal defect or patent foramen ovale) through which right-to-left shunting of blood may occur 3 . Depending on the severity of the hemodynamic derangements in patients with Ebstein's anomaly that is determined by the degree of displacement and the functional status of the tricuspid-valve leaflets, clinical presentation of Ebstein's anomaly varies from severe heart failure in a fetus or neonate to the absence of symptoms in an adult in whom it is discovered incidentally 4 . Late onset of clinical symptoms despite severe tricuspid-leaflet displacement with valvular dysfunction and elevated right atrial pressure is rare. The article describes a 50 years old man with late onsest of symptoms with at least moderate tricuspid-leaflet displacement and right valvular dysfunction. A 50 year old man was admitted to hospital because of dyspnea, atypical chest pain and fatique lasting for 3 months. On physical examination the heart rate was 80 per minute, and the first and second heart sounds were widely split. The blood pressure was 115 / 75 mm Hg. A systolic murmur was present at the left lower sternal border. Hepatomegaly was present. ECG revealed sinus rhythm and intermittent atrial flutter with 2:1 conduction and a ventricular rate of 136 beats per minute. Transthoracic echocardiography was inconclusive because of poor image quality. Transesophageal echocardiography (Figure; arrow indicates tricuspid valve) showed right ventricular dysfunction and severe tricuspid regurgitation. The tricuspid valve leaflets did not attach normally to the valve annulus, and the effective orifice was displaced downward into the right ventricular cavity at the junction of the inlet and trabecular components of the right ventricle. These findings were consistent with the diagnosis of Ebstein's malformation. Only the septal and posterior leaflets were displaced and divided the right ventricle into two portions. The inlet portion was integrated functionally with the right atrium (“atrialized portion”), while the other, including the trabecular and outlet portions, constitutes the functional right ventricle. Cardiac catheterization using an electrode catheter and monitoring the intracardiac electrogram and the intracardiac pressure simultaneously confirmed the diagnosis. The “atrialized” part of the right ventricle was depolarized like the right ventricle but showed right atrial pressure. In the patient described, control of intermittent atrial flutter could be archieved pharmacologically and clinical symptoms significantly improved with diuretic therapy and digoxin. The patient refused surgery. 18 months later the patient was still in stable condition with mild impairment of exercise tolerance. 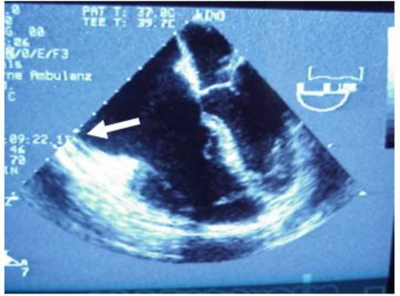 Figure: Transesophageal echocardiography (Figure; arrow indicates tricuspid valve) showed right ventricular dilatation and dysfunction and severe tricuspid regurgitation (not depicted here). The tricuspid valve leaflets did not attach normally to the valve annulus, and the effective orifice was displaced downward into the right ventricular cavity. The severity of the hemodynamic changes in patients with Ebstein's anomaly depends on the degree of displacement and the functional status of the tricuspid-valve leaflets. Patients with mild apical displacement of the tricuspid leaflets have normal valvular function, whereas those with severe tricuspid-leaflet displacement or abnormal anterior leaflet attachment, with valvular dysfunction, have elevated right atrial pressure and right-to-left interatrial shunting. Similarly, the clinical presentation of Ebstein's anomaly varies from severe heart failure in a fetus or neonate to the absence of symptoms in an adult in whom it is discovered incidentally 5 . Clinical presentation of Ebstein's anomaly with symptoms occurring first in adulthood despite moderate to severe tricuspid-leaflet displacement with valvular dysfunction and elevated right atrial pressure, as found in the patient described here, is rare. Echocardiography is used to assess right atrial dilatation, anatomical displacement and distortion of the tricuspid-valve leaflets, and the severity of tricuspid regurgitation or stenosis 6 , 7 . Patients with Ebstein's malformation usually have a reduced life expectancy and seldom reach the age of 50. Cardiac arrhythmia are common in patients with Ebstein's anomaly, in the vast majority, of the tachycardia type 8 . In adults with Ebstein's anomaly, the most important predictors of outcome are the New York Heart Association (NYHA) functional class, the heart size, the presence or absence of cyanosis, and the presence or absence of paroxysmal atrial tachycardias. The management of Ebstein's anomaly centers on the prevention and treatment of complications. Prophylaxis against infective endocarditis is recommended. Patients with symptomatic heart failure, as the patient described in this case report, are given diuretic agents and digoxin. Those with atrial arrhythmias may be treated pharmacologically or with catheter ablation 9 . Repair or replacement of the tricuspid valve in conjunction with closure of the interatrial communication, if present, is recommended for older patients who have severe symptoms despite medical therapy 10 . In addition, repair or replacement should be considered for patients with less severe symptoms who have cardiac enlargement, since this condition has a poor prognosis 11 . In the patient described here, control of intermittent atrial tachycardia could be achieved using digoxin and ß-blockers and clinical symptoms significantly improved with diuretic therapy. The patient refused surgery and was still in stable condition. 1. Brickner ME, Hillis LD, Lange RA. Congenital heart disease in adults. Second of two parts. N Engl J Med 2000;342:334-342. 2. Anderson KR, Zuberbuhler JR, Anderson RH, Becker AE, Lie JT. Morphologic spectrum of Ebstein's anomaly of the heart: a review. Mayo Clin Proc 1979;54:174-180. 3. Frescura C, Angelini A, Daliento L, Thiene G. Morphological aspects of Ebstein's anomaly in adults. Thorac Cardiovasc Surg 2000;48:203-208. 4. Moodie DS. Diagnosis and management of congenital heart disease in the adult. Cardiol Rev 2001;9:276-281. 5. Celermajer DS, Bull C, Till JA, et al. Ebstein's anomaly: presentation and outcome from fetus to adult. J Am Coll Cardiol 1994;23:170-176. 6. Shiina A, Seward JB, Edwards WD, Hagler DJ, Tajik AJ. Two-dimensional echocardiographic spectrum of Ebstein's anomaly: detailed anatomic assessment. J Am Coll Cardiol 1984;3:356-370. 7. Miller-Hance WC, Silverman NH. Transesophageal echocardiography (TEE) in congenital heart disease with focus on the adult. Cardiol Clin 2000;18:861-892. 8. Hebe J. Ebstein's anomaly in adults. Arrhythmias: diagnosis and therapeutic approach. Thorac Cardiovasc Surg 2000;48:214-219. 9. Ho SY, Goltz D, McCarthy K, Cook AC, Connell MG, Smith A, Anderson RH. The atrioventricular junctions in Ebstein malformation. Heart 2000;83:444-449. 10. Mair DD. Ebstein's anomaly: natural history and management. J Am Coll Cardiol 1992;19:1047-1048. 11. Augustin N, Schmidt-Habelmann P, Wottke M, Meisner H, Sebening F. Results after surgical repair of Ebstein's anomaly. Ann Thorac Surg 1997;63:1650-1656.